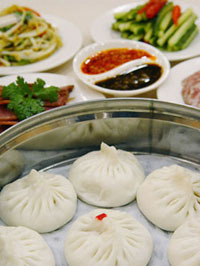 Among the great variety of snacks of Tianjin (tiān jīn 天津), the most renowned are the so-called "Three Unique Delicacies of Tianjin," which include "Goubuli Steamed Stuffed Buns (gǒu bú lǐ bāo zǐ 狗不理包子)", "18th Street Fried Dough Twists (shí bā jiē má huā 十八街麻花)" and "Er Duo Yan Zha Gaoer (ěr duǒ yǎn zhà gāo 耳朵眼炸糕)". In Tianjin, you can see an endless array of snack stands and restaurants offering such delicacies that will captivate your senses. As the most famous Tianjin snack, Goubuli steamed stuffed buns date back more than 150 years. What makes them so delicious is that all the processing steps, including selecting ingredients, mixing, stirring, rubbing and rolling, involve special techniques. The childhood name of Gao Guiyou (gāo guì yǒu 高贵友), the snack's inventor, was Gou Zi (gǒu zǐ 狗子). After he grew up, he made a living by making buns with meat stuffing. His buns were so popular that he did not even have time to talk to his customers. People joked, "Gou Zi (dog) sells buns and heeds nobody." Today, Goubuli has adopted "Go Believe" as its English brand. 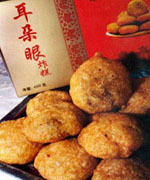 "Zha gao (zhà gāo炸糕)" literally means fried rice cakes. "Er duo yan zha gao" got its name from a nearby small alley called "Ear-hole Hutong (ěr duǒ yǎn hú tóng 耳朵眼胡同)" in Tianjin. With a history of more than 100 years ago, the fried rice cakes are made of carefully leavened and kneaded glutinous rice dough. The finished cakes are golden yellow in color, crispy, soft, sweet and tasty. They are made by frying bars of dough in peanut oil and stuffing them with a variety of fillings. The fried dough twists produced by Guifaxiang 18th Street are the most famous because they are prepared with well-selected ingredients and consummate skill. Crisp, aromatic and sweet, they will not become soft soon. Bengdou Zhang excels in making multi-flavor-coated legume snacks. The chain of stores dates back 200 years. The snack's inventor, Zhang Decai (zhāng dé cái 张德才), used to be a cook who made imperial dishes during the Qing Dynasty (qīng dài 清代). In the stores, you can find nuts, peas, beans and seeds of lotus, melon, pumpkin and sunflowers coated in innumerable ways and flavors. 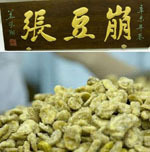 With a history of more than 160 years, Nut-kernel Zhang is famous for its peanuts, walnut kernels, melon seeds, apricots and pine nuts with sweet, sour and spicy flavors. "Guo ba cai" is another Tianjin snack known for its refreshing, smooth and delicious taste. It is made with sliced pancakes placed in a boiling pot of thick gravy. The contents are then taken out together with the thick gravy, and some special condiments are added. Both these flavors are appetizing, nutritious and healthy. 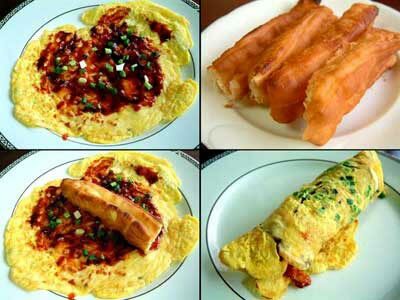 It is a kind of Chinese pancake that is usually sold as a fast breakfast food on the streets. "Guo zi" refers to deep-fried dough sticks in some places in northern China. When presented to customers, the thin pancake is rolled over with a deep-fried dough stick and some tailor-made condiments placed inside. Jingdong meat pies are a Muslim food. Their fillings contain fresh mutton and assorted seasonings.The surface of the pie is baked on a flat pan applied with thin cooking oil into something that is in golden color, and has a silky, fresh taste with no greasiness. Pork tripe stuffed with meat is a kind of braised food with soy sauce and is usually served as a cold dish. The snack is so-named because its layers of this distinct meat look like the portly belly of a Buddhist arhat, a Buddhist who has reached the stage of enlightenment. "Tang yuan" is a dish of glutinous rice balls served in a sweet broth. To make this snack, you pour glutinous rice flour in a bowl and slowly add water until the mixture becomes dough-like. Then you cut fresh fruit into pieces and stuff them into the dough. The famous Tianjin snack "gao gan" is a kind of dry cake that can be traced back to the early Ming Dynasty (míng dài 明代). Zhilanzhai produces the most famous "gao gan." Sweet, snow-white and refreshing, Zhilanzhai "gao gan" is appetizing and nutritious. With a light yellow color, it tastes mild and refreshing and is quite nutritious. The main ingredients are proso millet flour and glutinous millet flour. When a customer orders the dish, hot water is poured into the bowl containing the flour to create a paste-like mush. It is served with white and/or brown sugar and sweet osmanthus sauce. "Shui bao du" originated in 1920 and is a famous Tianjin local dish made from quick-boiled tripe. It is fresh, crisp, tender and refreshing and best consumed with plenty of seasoning during hot months. The dish is very good for the stomach.